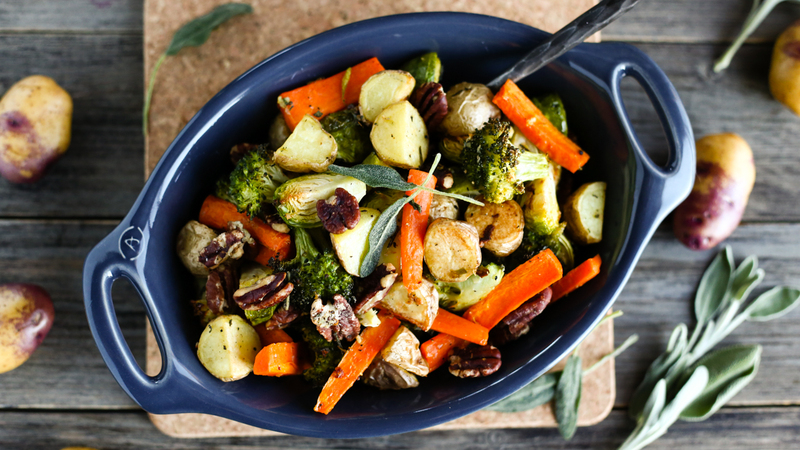 A chic and simple side dish of roasted Little Potatoes, broccoli, Brussels sprouts, carrots, and pecans in a sage-y garlic butter. Preheat oven to 425°F. Line a baking sheet with parchment paper. In a large bowl, combine quartered Creamer potatoes, broccoli florets, carrot sticks, quartered Brussels sprouts, melted vegan butter, garlic, sage, salt and pepper. Massage the vegetables (especially the broccoli tops) to infuse the flavours from the garlic, sage, salt, and pepper. Spread vegetables in a single layer oven baking sheet. Bake for 25 minutes. In the same bowl you mixed the vegetables in, add pecans and toss to coat with remaining butter, garlic, and sage. Sprinkle with salt and pepper. After vegetables have baked for 25 minutes, sprinkle sheet with seasoned pecans and bake for an additional five minutes or until vegetables are tender and browned and pecans smell toasty. Notes: Use soy-free vegan butter for a soy-free side dish. To garnish (optional): Heat a few tbsp of oil in a frying pan over medium-high heat. Once oil is hot, briefly fry whole sage leaves until leaves are crisp, turn dark green, and the oil stops bubbling.